The existence of numerous spas calling themselves a "green spa" is a challenge facing not only consumers but also the industry in general. How can the guest be sure the spa is an authentic green spa and compare it with its competitors? And how can a spa itself prove that it is concerned about people and planet? This is where standards and criteria come in. 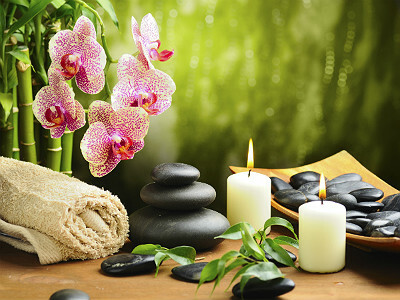 They assess all activities a spa claims to follow in order to be categorized as a green spa. If the business performs well regarding its sustainability measures, it can obtain a certificate as proof for being green. However, several different standards and criteria for the green spa industry exist — which again is not easy, because spas need to choose which one they want to use in order to get certified. Within this article the most important and recognized standards of green spas are presented and critically analyzed. The Green Globe Standard, which is represented in 87 countries, can be categorized as the most prevalent assessment of the sustainability performance of businesses in the tourism and travel industry. Together with the British International Spa Association (BISA), Green Globe developed the "Essential Spa Standards" (ESS), which are now part of the worldwide Green Globe set of criteria. With the help of this standard, spas can monitor their improvements as well as document their achievements, which are consequently leading to a certification of their sustainable and green management and operation. Furthermore, a third-party independent auditor works together with spas on-site in order to assure fulfillment of the highest international standards. Additionally, the Green Globe Standard is updated and reviewed twice per year in order to guarantee a high quality. Another global source for sustainability management is the Green Spa Code, which was developed by Lutz Hertel, Catharine Banach and Thomas Jäger for the German Wellness Association. It contains guiding principles for ecological, healthy, social and economical sustainable actions in spa and wellness businesses, which are the basis for an international certification program. The code highlights the importance of the fact that health and well-being of people need to be regarded in the context of their environment. Employees and operators of green spas should be aware of this fact and take it into consideration while doing business. The focus of a green spa is on the health and well-being of its guests and all other persons involved in spa services and treatments. Green spas are mindful of resources they use during their service processes. Furthermore, the use of innovative products, materials, methods and technologies is recommended. A green spa is characterized by respecting the nature and biological diversity. Green spas recycle, reduce water use, care for a clean environment and conduct waste management. Supporting the local community and purchasing products from local suppliers is another rule a green spa follows. Satisfied and healthy employees are crucial for a green spa. Therefore, green spas care about safety, transparency and fairness at the workplace. Green spas also want to create awareness among guests for a healthy, ecological, economical, sustainable and social action. Finally, the manager of a green spa approves the principles mentioned above by signing the Green Spa Code. Consequently, the name of this person will be published on the German Wellness Association website. Additionally, suppliers can sign this code. In the end, members of the German Wellness Association who are in the working group, which is called "Green Spa," are endorsed to display the logo "Green Spa Partner." As a second step, the German Wellness Association also offers a Green Spa Certificate, which can be obtained through signing the Green Spa Code and applying for a certification procedure. A group of external auditors will do an inspection of the business on-site by checking if the spa meets a predefined set of criteria. The basis for this set of criteria are the guidelines of the Green Spa Code the manager of the spa already signed. In order to obtain the certificate, the spa needs to be valued with at least 60 percent out of the reachable percentage. Furthermore, the spa can be certified with a Level 1, Level 2 or Level 3 seal (Level 3 would be 90 percent out of the reachable percentage). If a spa obtains such a Green Spa Certificate, it will be valid for 24 months. Within this time frame, the German Wellness Association is authorized to examine whether the business is in compliance with the requested criteria. If the spa wants to remain certified after the initial two years, it needs to go through a re-certification process. The GreenGain Sustainability Tool is an online tool for members of the Green Spa Network. It is a points-based assessment method to evaluate the environmental as well as social performance of a green spa. Originally, GreenGain was created for general business use. However, the Green Spa Network customized a version of GreenGain particularly for the spa industry together with Green America. The questions asked during the assessment, which focuses on the three areas environmental sustainability, social justice and accountability, emphasize an operational action the spa can take or already has accomplished. Furthermore, the questions comprise both, general initiatives that are valid to every business and actions tailored to the spa industry. After completing the initial assessment, which takes up to one hour, the tool creates a customized plan. Its implementation should help to improve the spa’s environmental performance over time. This plan focuses on most possible progress with the least investment of time and money. Moreover, spas that use GreenGain will be displayed in the Green Spa Network directory and on the spa locator map on the organization's website. Leadership in Energy and Environmental Design (LEED) is an internationally recognized green building program that provides owners and operators with an outline in order to identify and implement useful and measurable green building construction, design, operations as well as maintenance actions. So far, LEED projects have been formed in 135 countries worldwide and international projects outside the United States count for more than 50 percent of the total LEED registered square footage. Developed by the U.S. Green Building Council in Washington, D.C., the LEED rating system offers a certification at four levels, namely Certified, Silver, Gold and Platinum. The individual rating is based on the amount of credits awarded in the following five environmental categories: sustainable sites, materials and resources, water efficiency, energy and atmosphere and the quality of the indoor environment. Commercial buildings like a spa need to satisfy all LEED fundamentals and receive a minimum 40 points on a 110-point LEED rating system scale to get a LEED certification. The table below gives an overview of the five different standards for the green spa industry which were mentioned within this subchapter. 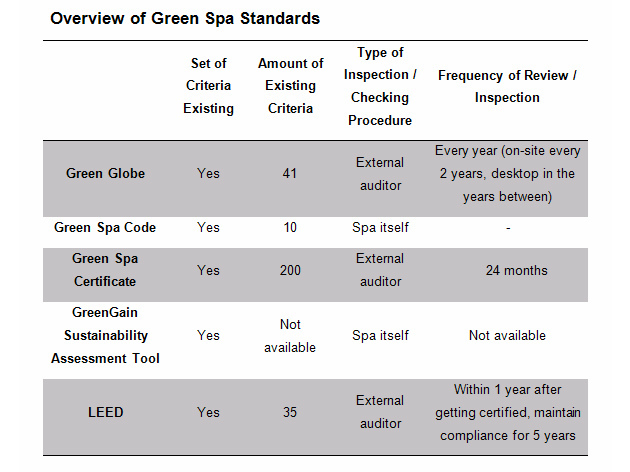 As shown in the table above, the different standards and certification options for green spas differ significantly. The Green Globe certification provides a wide set of criteria which is reviewed by external auditors. Additionally, the compliance of the spa with the criteria and standards is controlled on an annual basis. This certification system can be categorized as an objective, strict and reliable seal for green spas. By signing the Green Spa Code, the spa manager follows 10 guidelines toward being green and sustainable within the spa operations. However, there is no external auditor who controls if the spa is following these guidelines. Moreover, there is no review after a certain time period — as soon as the spa manager signs the code, the spa will be published on the website of the German Wellness Association. As this certification is a subjective assessment of the spa through its manager, it is not trustworthy and could further increase green washing within the industry. In addition to the Green Spa Code, the German Wellness Association also provides the possibility of obtaining a Green Spa Certification. In order to be certified, a spa needs to comply with an extensive set of specific criteria and has to pass an external audit. After a 24 months’ time period, the certification expires and a re-certification process needs to be conducted. This certification seems to be trustworthy and reliable. The GreenGain Sustainability Assessment Tool is a relatively new standard which is checked by the spa management itself based on a set of criteria. Unfortunately, I was not able to collect more helpful information concerning this tool. The LEED certification process includes the external review of a wide set of criteria. After receiving the certification, the spa needs to prove compliance with the rules within the first year after getting certified. Moreover, it needs to maintain compliance for at least five years. The LEED certification system follows strict regulations and mostly promises authentic green building activities. Of course, the ranking can vary from person to person. You as a spa manager or spa owner need to take all information concerning the different standards into consideration and decide which certification is the best choice for your spa. Beatrice (Vallant) Hochegger is a 24-year-old spa enthusiast from Austria. She recently graduated with a master of arts in business degree from IMC FH Krems, majoring in tourism and leisure management with a focus on spa management. She assisted in opening Deer Lake Lodge & Spa, an exclusive, green and sustainable destination health spa and wellness resort located in Montgomery, Texas, and wants to start a career within the American spa industry.